Since this type of hair is naturally smooth, it’s easy to create low-effort knots and braids that stay in place. This elegant and incredibly easy hairstyle won’t go unnoticed with your friends and colleagues. When they ask you “hey, how did you do that?” you can just tell them it took you less than 5 minutes. Tip: A good trick is to secure the bobby pin in the same angle as the bow so that it doesn’t look like you put bobby pins in your hair. Also, it’s best to choose a bobby pin with the same exact color as your hair. Comb through all of your hair gently with a brush, and divide 1.5” strands from both sides of your face. Make sure they are even, as this help the bow stay in shape (and not fall from the weight of the heavier strand). Pull both sections back, and cross them over, pulling the strands on both sides. Tie a bow with the two strands, with a bobby pin handy. Tighten the bow, and place one finger at the base. Use the other hand to get the bobby pin and secure the bow in place. If needed, use another bobby pin crossed over to make sure it doesn’t fall apart. This type can range from a more smooth and straight type with a few kinks, to borderline curly-looking waves. Wavy hair is s-shaped, so take advantage of the texture and give it a 5-minute whirl. If you have wavy hair ranging on the more straight side with a few kinks, this romantic look is for you. Back comb the hair gently from the root and the front parts of the hair until you get enough texture and volume to twist. Neatly twist the right strand of your hair, and capture it in the middle of your head with your left hand. Hold it in place and insert a bobby pin to keep it. Then twist the left side of your hair and loop it inside the right strand, fitting it into the loop. Then, Twist it again, creating the illusion that the base is a twist. Lock it into place with a bobby pin. Fix any strands, baby hairs or outliers with a light holding spray and a thin-tooth comb. Tip: finger comb (don’t use an actual comb) through the rest of your strands to keep the wavy texture, and lock it all in with a texturizing spray. Back comb a little bit if needed. Whether your hair is more on the s-waved curls end, or spiraling out of control, here’s a hairstyle sure to keep everything in place. Here’s an easy way to get your hair from your face and look stylish for work, family events and dinner with friends. Pull back your hair from the sides until it’s tight on both ends. Leave the top of the hair loose, for a fauxhawk look. Secure your hair with a small clear elastic. Twist the ponytail upward to create a spiral-curl effect at the end of the ponytail. Pin the outlying tendrils from falling out with your fingers and secure it with bobby pins. Repeat step 3 if necessary. The more bobby pins, the more secure the ponytail. Tip: Before styling your hair, wash it thoroughly with a moisturizing shampoo and conditioner, and use mousse from your ends to your root to keep your hair curly and fresh-looking. This easy and modern low bun is definitely a less-than-5-minute alternative to tying your hair in a low bun. The knot gives it the extra umph it needs in order to have a sophisticated look & feel without all of the effort. Gently finger comb or use a wide-tooth comb to separate your pieces with precision. Divide the hair into two sections, split evenly down the middle. Tie the two strands in a low knot, pulling on both sides of the strands in the opposite directions (to tighten the knot). After tightening the knot, tie the knot again until it’s a small knot with the strands on both sides. 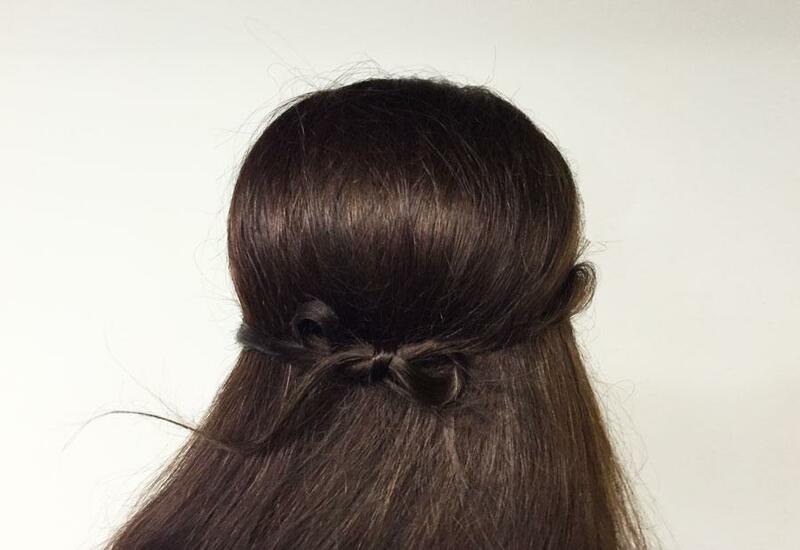 Combine the two strands and tie the hair with a small, clear hair tie at the base of the knot. Then, tuck the small ponytail at the base of the knot inside and use bobby pins to secure it in place. Tip: For a slightly more feminine look, pull a few strands out from the front to create a slightly messy and and romantic style.